OPINION: The iFlux's take on "The Saddam Hussein Indictment"
The iFlux's take on "The Saddam Hussein Indictment"
The verdict has come, Saddam has given the capital punishment by the American puppet administration in Iraq. There were much controversy surrounding the timing of this, especially when 'W' is struggling to win the congressional elections. Now that the strategies of W miserably failed to bag support from the American taxpayers, but i would still argue that this gubernatorial fiasco has nothing to do with his Iraq arbitration, the decision of invading the state 3 years ago. It IS Rumsfeld who has to be blamed for this Republican annihilation; especially after reading Slate's portrayal of his biggest blunders. I dream of tomorrows when the countries and the differences wherein can be merged to the 'one world' full of happiness. There exists a huge responsibility for rich and powerful democratic countries of today to fight for the human rights anywhere else where it is being questioned, let it be in Africa or in Middle east. It is apparent that ALL of the Muslim and Socialist states where the autocracy prevails, never possess history of venerating personal prerogative. I repeat, ALL, because I find not even a single exception. For the same reason I would back any legitimate action by the powerful states to safeguard humanitarian interest and to let down dominance of detested figures. Either you consider W as the head of republican party or as a leader of US, the American invasion of Iraq is not justifiable still, providing every nation has to respect other's independent spirit and "the republican essence". Let us forget how prejudiced the new Iraq parliament is, how logical Saddam's resonating clamor: "I, the president of Iraq" inside Baghdad court room was, it was still profoundly exhilarating to read about the Saddam's verdict. Let us not forget 1000s of Kurdish lives taken by this 'Satan' and still echoing grievances, how his atrocities corked up the democratic outcries of Iraq. Saddam is cruel, and he deserves to be punished to any extreme. Amnesty spoke against the verdict, as they always been. 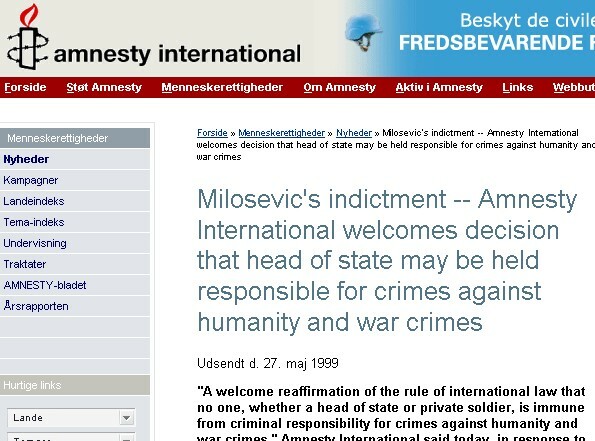 Look back their comments when the verdict to hang Slobodan Milosevic came out (Look Screen capture Below). Given that Amnesty Int. 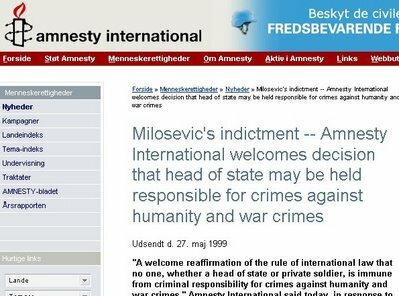 acknowledges Milosevic and Saddam and both of their governance as inhuman, totalitarian and cruel to free thinking womankind, it is irrational to only criticize the manner in which Saddam is prosecuted. 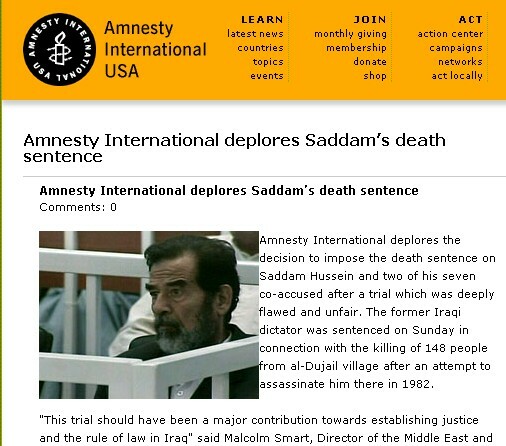 Saddam deserves nothing but pinnacle of menial treatment, but the question is that death sentence, an answer? I don't agree with decision of scores of Christian states like Portugal to ban death sentence. This is not a question of providential belief, I am a believer though. My simple logic states "If you can kill a plant or fish and agree with the reason that both has essence of divine life within, you can kill another human as well, because the world is not anthropocentric". I wish someone could skin Saddam and let him live "F" days in extreme pain anyone could probably imagine, where, F=the number of people who were estimated to be killed in his regime. I wish the same Bushian logic needs to be applied wherever the personal liberty is jeopardized, To name few: ALL Nations designated as MUSLIM and (out of context, but) China, Myanmar (haven't you seen video of Than Shwe's daughter's wedding? For your viewing pleasure, I put it below), Brunei and so on. PS: I am reconsidering the original "Suggestion 1" after reading Dr.Jayshankar's comments. Instead of 'incineration', 'recycling' is definitely much better for recyclable garbage, and I guess Saddam can be recycled for the 'benefit of the humankind'. I totally agree with what you have wrote. So many people suffered at the hands of this man that it is only fit that he should suffer too. All of the wicked deeds that he did, he should be made victim to. Dying is the easy way out for him and he does not deserve that. 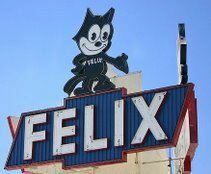 Dear Flexy.. I agry with your intense imotion against SH who killed 100s of 1000 people and he deserves the maximum punishment possible. but who can be responsible or be hanged for the 650000 iraqis killed during iraq invasion led by US? Bush? Ramsfeld? Blayer? or who? Do u think wars can bring democracy? never!! do u have the mere expectation that post-war iraq will be a better country?? obiviously no. Wht US invasion did is only to destroy Iraq in a way it cannot fully recover in the next few decades. wht can be the punishment to INDVIDUALS who killed lakhs of innocent people and destroyed an ancient culture? I think wars can nver give a solution to any problem and we need to think of alternative ways!